(a) Using a screwdriver, detach the 4 claws and remove the garnish. (a) Using a T25 "torx" driver, remove the 4 screws and glass. (a) Disconnect the 4 drain hoses. (a) Detach the 3 claws and remove the rail spacer. (a) Detach the 4 claws and remove the rail spacer. (a) Remove the 2 bolts and bracket. (a) Disconnect the drive gear connector. (b) Remove the 8 nuts and roof housing. (a) Remove the 2 stoppers. (b) Slide and remove the sunshade trim. (a) Using a screwdriver, slide the drive cable. (b) Detach the claw, and remove the deflector panel. (a) Remove the screw and housing panel. (a) Using a screwdriver, slide the drive cables backward and remove them. 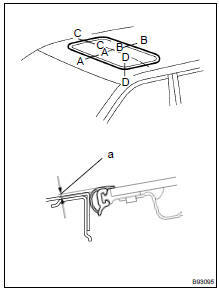 (a) Using a screwdriver, slide the sliding roof drive cable LH and RH to align the matchmaks. HINT:Tape the screwdriver tip before use. (b) Install the housing panel with the 2 screws. (a) Engage the claw, and install the deflector panel. (a) Insert the sunshade trim into the sliding roof housing. (b) Install the 2 stoppers. (a) Install the drive gear with the 2 bolts. (b) Install the bracket to the drive gear. (a) Install the roof housing with the 8 nuts. (b) Connect the drive gear connector. (a) Install the bracket with the 2 bolts. (a) Connect the 4 drain hoses. (a) Using a T25 "torx driver, temporarily install the sliding roof glass with the 4 screws." (b) Perform a level check. (c) Perform a gap check. NOTICE: The gap must be even all around. (d) Using a T25 "torx" driver, install the sliding roof glass with the 4 screws. (a) Attach the 4 claws to install the garnish. (a) Adjust the sliding roof glass, and check for water leaks. (b) If there are any leaks, readjust the sliding roof glass. (a) Attach the 4 claws to install the rail spacer. (a) Attach the 3 claws to install rail spacer.